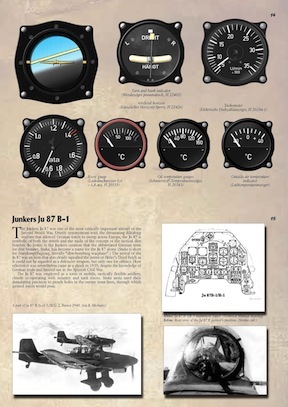 MMP Books » Books » Inside » German Aircraft Instrument Panels vol. 2. This book from the series “INSIDE” shows detailed drawings of the German aircraft instrument panels in great detail. Bf 109 E-4 panel is also shown in original size! 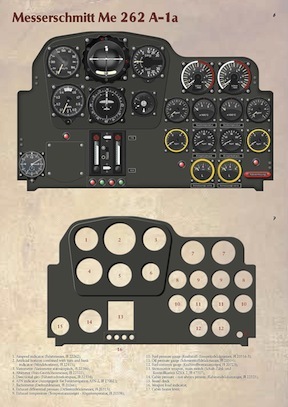 The drawings portray the entire panel with instruments in place, then the same panel in which numbers replace the instruments/controls accompanied by a legend stating each (well, most) items’ function/name as well as the corresponding German name and the part number. New this time is a life-size 31 x 22″ poster on glossy paper of the Bf 109 main front panel—complete with “scratched” edges on the metal panel (see bottom). Very cool. Pity that it contains four typos . . .. Modelers, who will be the main consumers of a book such as this, are by nature eagle-eyed but if they work at this level of detail customization they will also have dealt with cockpit controls before and have seen photos or have other reference material so the typos shouldn’t throw them. As before, the book is printed in landscape format but the binding and cover are portrait so the books stands nicely upright on the shelf. Each aircraft is introduced with a few general comments and several period photos of the aircraft and, in the case of the Me 262 and Bf 109 a modern-day museum color photo. Some of the line art is in the form of reproductions from manuals and handbooks but the Revi 12 gun sight is also rendered in a modern walkaround-style color drawing. This as well as some other items also come with a scannable code that takes you to interactive material on the publisher’s website. 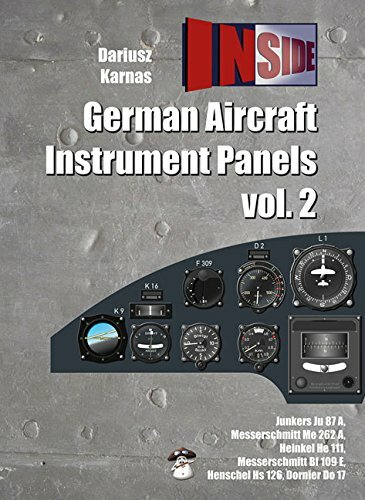 This is the second volume of the “Inside” series of books featuring the instrument panels of various German WWII aircraft. MMP Books previously released Vol 1 which covered the Bf-109F-4, Bf-110E, Fi-156 Storch, Fw-190A-3, Hs-123, and the Ju-88A-4. This second volume covers the Bf-109E, Me-262A, Ju-87A, He-111, Hs-126 and the Do-17. A special treat awaits the reader. 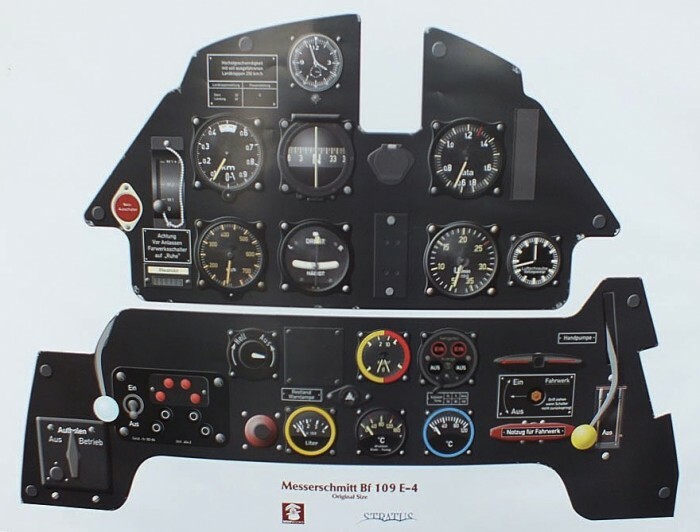 The panel for the Bf-109E-4 is provided, full size, as a poster! In North America, Casemate is the distributor for MMP. As in the previous volume, there are two characteristics that make this book very useful to modelers. First, the entire instrument panel for each of the six aircraft featured is provided in full color. Secondly, every single instrument seen in the panel illustration is also shown in a separate drawing. These drawings are quite large and are close to “actual size” of the instrument face and bezel. The detail offered by this MMP book will guide the modeler who wants to create a more accurate and highly detailed instrument panel than is offered by kit decals. You can view a book trailer which shows every page in the book, one at a time, at http://mmpbooks.biz/ksiazki/286. This book is highly recommended. The artwork is superb, the accompanying text is clear and concise, and the black & white images are clean and sharp. Thanks go to Mushroom Models Publications for the opportunity to review it.